I just checked my clean Seven Semper Fi machine — it doesn’t have the nagware KB 4493132 patch — and it, too, has the scheduled task refreshgwxconfig-B. Michael432 1 week, 6 days ago. If it has not already forced an upgrade from Win 7 to Win 10, is that because it needs also to have the nagware patch installed for that to happen? And does “admins cannot disable it” mean that the directory in which it resides cannot be deleted? Or has this reappearing software made changes already to the Registry, so it does not matter any longer whether it is deleted or not? Highly, highly unlikely it’ll force an upgrade to Win10. Microsoft isn’t giving away free Win10 upgrades anymore. Which is why everybody’s wondering what in the Sam Hill this thing does. The directory is part of the registry. I don’t know why admins can’t delete the scheduled task, but it sure isn’t a good way to instill confidence in Microsoft’s benevolence, eh? You mean we can’t use old Win7 keys to activate Win 10 anymore? Would appear that having your product key accepted for activation is, by strict definitions, neither necessary nor sufficient for determining that you do have a license. Just, sort of a guideline. There has to be a way to delete it from Windows 7, Does Windows 7 rescue media have the tools takeown & an icacls? Woody, I’m not seeing any such task on my desktop PC. I’m currently running W7 Enterprise SP1 and I just checked the Task Scheduler and no such task exists. I’m pretty sure our Network is blocking such nonsense from MS.
I’ll check my old laptop when I get home as it is still running W7 Home. I don’t get any updates from MS on either PC that I don’t want. I’ve locked everything down on both and don’t hear any carping from MS about updates/upgrades and such. There is another reason, why Microsoft won’t upgrade Win 7/8.1 machines automatically to Windows 10. Microsoft Germany (and other international MS subsidaries) have received a injunction (and signed that) Becomes expensive, if against it is offended. “admins can not disable” refers to the scheduled task. Most can be disabled by an Admin class user. Not this one. Just checked the Task Scheduler and refreshgwxconfig-B is not there. KB4493132 has not been installed. Are you sure it’s not EOONotify (End of Offer Notification)? I have checked two of my Win7 machines and I don’t find any indication of anything gwx (task or folder). I have to say this, though: the GWX patches were never installed on any of my machines from the git-go. Also, I have not installed the telemetry patches until KB2952664 was incorporated into the Rollups. And I have been running @abbodi86 ‘s script to disable it (Scheduled Task on bootup) ever since. Nor have I installed KB4493132 (EOL notification). I will report on the rest to the Win7 PCs when I have time to look. Yes, positive it is End of Support Notification (EOSNotify). It has 3 triggers and is set to run EOSNotify.exe in /System32 folder. It was at status Ready. Windows 7 RTM or SP1? The path is in the main blog post above. Not a joke, though I certainly understand why you would think so. I’ll check a few other Win 7 machines when I can get access to them. I wonder if this is something Pro doesn’t get, but Ultimate does (unless, like PKCano, you kept GWX off your machines in the first place – if I recall correctly, PKCano has Ultimate), sort of like the nagware patch KB4493132 appeared to be. One I looked at was Ultimate, the other was Pro. ). I assumed this was a failed SSU update which I then installed manually on March 12 (KB4490628). I haven’t patched in two years and don’t even have a Microsoft\Windows\Setup in the Task Scheduler. I don’t see anything obvious anywhere that shouldn’t be there. Microsoft sneaking stuff like this into updates was a significant concern of mine and was one factor in my decision to stop patching. I hope this isn’t GWX part two. It doesn’t concern me that Windows 10 isn’t free anymore as I think they would make an exception in the event of forced upgrades. After all, they want people on Windows 10 and maybe they want it bad enough that the benefit from another forced upgrade campaign may outweigh the initial financial aspect. Good luck, you guys. I hope it’s not what it looks like. Also, I have not installed the telemetry patches until KB2952664 was incorporated into the Rollups. Urg! I removed this devil ‘way back when; now it’s incorporated into every Security Quality Monthly Rollup?? BTW, no sign of GWX on scheduler here. Not even being offered KB4493132 as an option. KB2952664 functionality was incorporated beginning with the 2018-09 Preview Rollup and the 2018-10 SMQR. Edit to correct date/year to 2018. Thanks for the head’s up! Good old Steve; he writes in assembly, then complains about the file size being too big! 1. Did you mean 2018-10 (Oct 2018)? 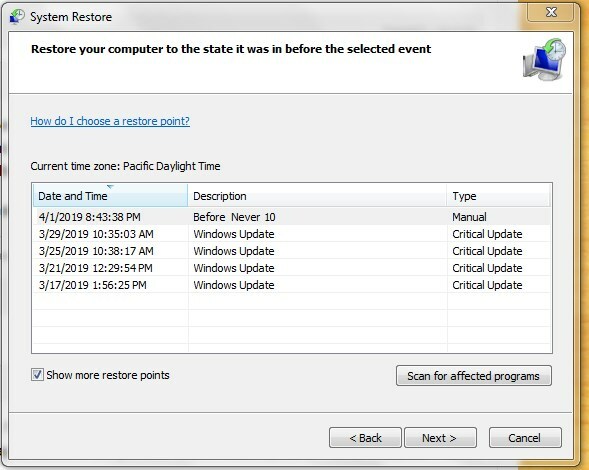 It seems like the previous 4 restore points were done by WU surreptitiously and listed as “critical”. Scanning “affected programs” revealed nothing. What’s up with that? I have WU shut down! What am I missing? 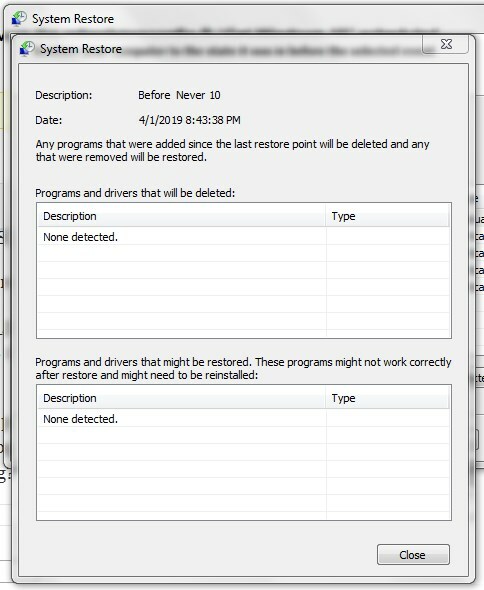 Perhaps the restore points are Defender updates, which are done in the background even if you don’t initiate. Yup, knew that (in my case) MSE did that. but when checking WU, it always lists malware/virus definition updates as “Optional” if they’re ready. But why is it as listed “Optional” in one routine (WU) and “Critical”, in another (System Restores Available Dialog) and “Recommended” in WU History? Some of the dates/Restore Points match up with definition updates, and some definitions don’t. Makes no sense. Oh, silly me, we’re talking about the MSFT rabbit-hole here, not logic. Maybe I got spoiled with Eset years ago, when they rolled them out sometimes multiple times a day, and it was always “Important”. If something got fouled up and it hadn’t updated itself in 24 hours, it’s holler a “yellow alert” on you. Maybe some Definition Updates are Critical, some are Important, some are Optional. Sorry, but don’t you mean 2018? Windows 7 Ultimate 64, Group B since it was first available. No sign of a scheduled “refreshgwxconfig-B” and “setup\gwx” is empty. Yup, it’s in our corporate Win7 fleet of PCs (and they only got updates from our WSUS server that only hands out Security Only Updates). These are PCs that were only built just over a year ago and should therefore never have had a historical GWX trace on them. 2952664 never touched these. Task history shows it was created on February 11, which was when we released the January patches onto our fleet. The history also shows that the patch that incorporates it also first deleted any existing refreshgwxconfig tasks (to make sure the new one would definitely get the settings the patch wants to enforce) and then created the new one. Looks like it’s time to bring out the GWX blocking tools again. I knew Microsoft would not give up so easily. They’ll rather give Windows 10 away for free again to boost their ongoing revenue (through all the c**p incorporated in W10) and kill off that pesky zombie OS that we love. What was the purpose to build machines with Win7 like year ago? You should have known this will unaviodably happen anyway. Compatibility? I visited a HUGE retail chain lately and all of the PCs were on W7 still. OK, I understand your angle of view. Now this HUGE retail chain will face the problem of migrating all W7 to W10, or they will pay for additional support. So will PerthMike. I think, that in big companies, you just created more work for yourself, if you installed W7. You have got to think ahead. I have to say, everything that worked for me in W7 works in W10 too. Plus in W10 for example Android Debug Bridge works way better than before (I am configuring Zebra WT6000 and MC33 from command prompt now). I think, that in big companies, you just created more work for yourself, if you installed W7. You have got to think ahead. I have to say, everything that worked for me in W7 works in W10 too. doriel, it’s not just the retail chain stores that have this issue. The company I work for has invested a great deal of money in equipment that makes the garden variety PC look like change you find on the ground. We’re talking Precision Network Analyzers and such…and they are running on…you guessed it…W7. Now this is something that goes up the food chain to a large company (Keysight) who manufactures these devices with an embedded OS (W7). They didn’t start trickling out the W10 motherboard equipped devices until late 2017. They didn’t even offer a motherboard replacement to upgrade to W10 until 2018, and the cost for that upgrade is staggering. Not all versions of those older motherboards and/or equipment are compatible with the upgrade motherboards. If that is the case, then you’re looking at something in the price range of $250K for a new device. I’m sure Keysight knew this was coming down the pike, and I can’t say when they started working on the new embedded OS motherboards but it sure took them a while to get the design out to market…3 years before the OS is scheduled for retirement. Not everyone or every company has the luxury of upgrading to W10 like you or I do…and the cost can be mind boggling for those companies. I understand, I dont want to argue or be arogant, I try to understand your needs. For unique technologies, you may need extra PC. Even with XP SP3 or something. But for office computers, there is no doubt, that you should buy W10. Build W7 machines for office using these days is (by my opinion) nonsense (MS Office, SAP, AutoCAD, Webex Meet, Skype, Synology Surveillence, … everything works on W10). I think, that the worst thing about new licensing is that you do not buy product, but Windows as a service. The sky is not falling, you can still go well on W7 for several years in the future, but there wont be any patch to repair its vulnerabilities. May not be big deal if yor corporate firewall is well setupped solid tool. There’s still a bunch of business-critical software that doesn’t work right in anything newer. These often have a common feature in that they need to talk with specific kinds of non-computer hardware (anything from factory floor equipment to specific models of cash registers and medical instrumentation). Then, just get a second newer system for general office work. I’m not seeing it either – i’m on windows 7 home premium and have all security only updates up to and including february but no nagware patch installed. I told you not to trust them, they’ll sneak this in if it kills them. ETA: I should add that i have installed the latest SSU (KB4490628). Home Premium, hid 132, I installed “never 10” when it first came out. Nothing showing. It’s been awhile , maybe some of the posters didn’t know about or never installed “Never 10”. Not in my Task Scheduler, nothing GWX. Running Win7 Home, updated through Feb 2019. I have Windows 7 64B Ultimate, I did a fresh install after the GWX fiasco and have been strictly Group B since then. I keep GWX Control Panel monitor on all the time and I have the latest WPD as well. I have do not have this task in my scheduler. I have the March updates installed and Windows Update won’t offer me the KB 4493132, nor is it installed. FYI. PC in question in Win7 Profession and was last updated with patches March 18, 2019. Glad to hear its not a universal thing. Most GWX stuff has been removed from WU now. Microfix, Does a “fresh start” and now being “completely up-to-date”mean also installing all OK Win 7 patches, at least since SP1? Is there a method you have used to make such a job easier and quicker than getting every patch from the MS Catalog and applying it, one at the time (with many successive restarts between patches)? Perhaps downloading them with a script and installing them likewise? I just posted this this morning. See if it answers your questions. Does a “fresh start” and now being “completely up-to-date”mean also installing all OK Win 7 patches, at least since SP1? Win7 is now reduced to an 8.8Gb footprint (normal W7 installation is circa 15Gb) I’m on the bleeding edge with System Restore disabled and files removed using DISM++ most programs and apps are portable. Also created a system image offline for storage. You also write that you left Windows Update do its thing while you went off for a couple of hours to do something else. So, (1) how did you manage to block some patches while WU was applying many of them without supervising it? (2) Was there, at first, a very long list presented by WU and you went hiding the problematic updates by hand until you were done with all those showing up in the list? (3) You had to make a restart and then more patches showed up, so then you repeated the same action? No scheduled task as described. Nothing here, except extreme paranoia now ! No nagware patch installed. KB2952664 not installed. I did some more digging and I am reasonably sure why this one computer has GWX. To see the GWX scheduled tasks you need to run the task display as an admin user. I found 8 GWX scheduled tasks, not just one. I also found two scheduler folders for GWX both in the C:\Windows\System32\Tasks\Microsoft\Windows\Setup folder. Then, I looked at the program(s) these tasks run – they are C:\Windows\System32\GWX. Looking at the folder, it does not exist. Way back when, one my anti-GWX strategies was to rename this folder to C:\Windows\System32\GWX-xxxxxxx. Thus these GWX tasks have been failing for years. Chances are they are trying to remove GWX. I don’t know if the scheduled tasks are new or old. Anyone know how to tell when a scheduled task was created? Does this explain what others are seeing?